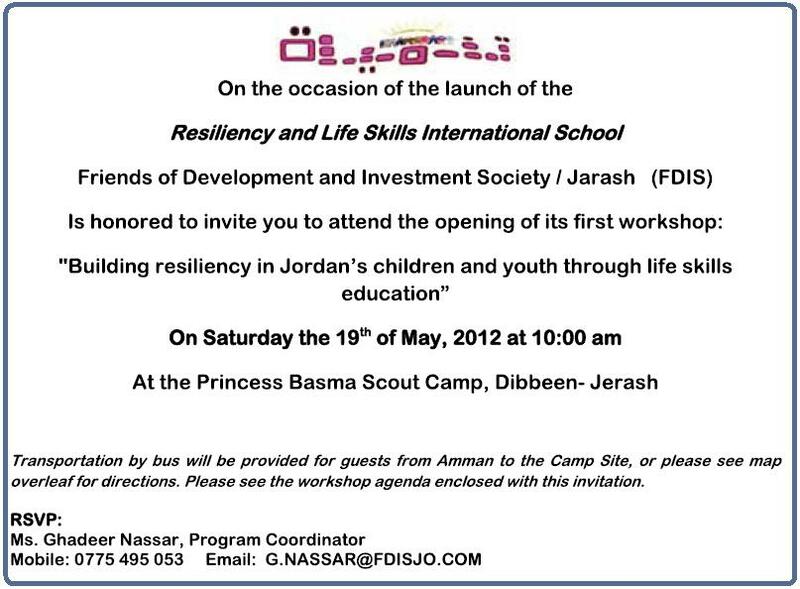 FDIS is launching the Resiliency and Life Skills International School with a short two-day workshop entitled “Building resiliency in Jordan’s children and youth through life skills education”. 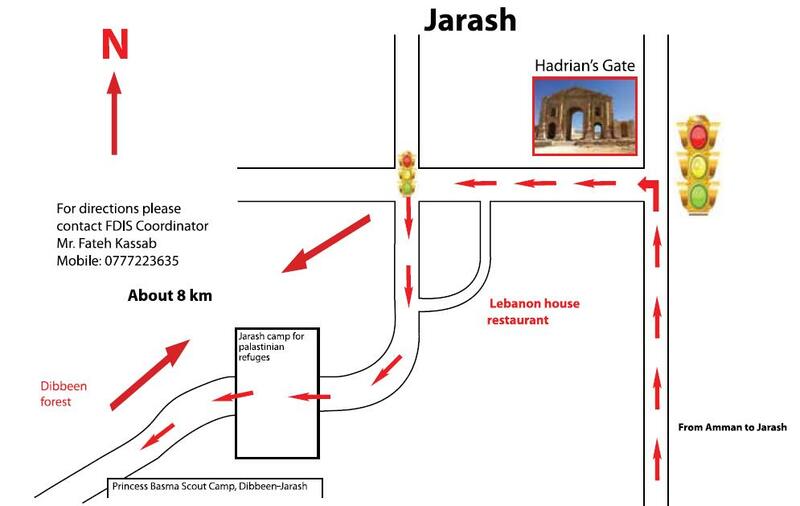 The two-day workshop will be delivered to 20 marginalized youth in the Jerash Governorate, including street children, child labourers, hard-to-reach rural populations, victims of child abuse and Syrian refugee children. 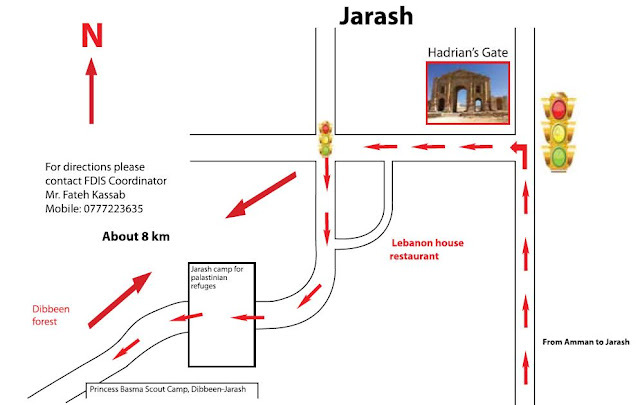 The first of its kind in Jordan, The Resiliency and Life Skills International School was founded by FDIS in April 2012 to meet the urgent needs of the most vulnerable and marginalized children and youth in Jordan. Please see the workshop agenda enclosed with this invitation. Life skills have been defined by the World Health Organization (WHO) as “abilities for adaptive and positive behavior that enable individuals to deal effectively with the demands and challenges of everyday life”. They represent the psycho-social skills that determine valued behaviour and include reflective skills such as problem-solving and critical thinking, to personal skills such as self-awareness, and to interpersonal skills. Practicing life skills leads to qualities such as self-esteem, sociability and tolerance, to action competencies to take action and generate change, and to capabilities to have the freedom to decide what to do and who to be. Life Skills-Based Education (LSBE) has a long history of supporting child development and health promotion. In 1986, the Ottawa Charter for Health Promotion recognized life skills in terms of making better health choices. The 1989 Convention on the Rights of the Child (CRC) linked life skills to education by stating that education should be directed towards the development of the child’s fullest potential. Expected learning outcomes include a combination of knowledge, values, attitudes and skills with a particular emphasis on those skills that related to critical thinking and problem solving, self management and communication and inter-personal skills. 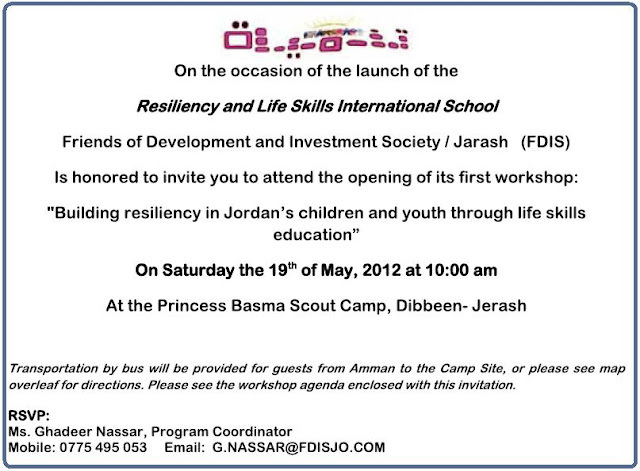 FDIS’s Resiliency and Life Skills International School will provide training programs for marginalized and vulnerable children and youth in Jordan, with the aim of preventing substance abuse to reduce the risks of alcohol, tobacco, drug abuse, and violence by targeting the major social and psychological factors that promote the initiation of substance use and other risky behaviors. Life Skills-based education provides adolescents and young teens with the confidence and skills necessary to successfully handle challenging situations. Life Skills-based education promotes healthy alternatives to risky behavior, rather than merely teaching information about the dangers of substance abuse. Turkish and also Arabic flicks in page4.me/ addition to live cricket, NBA TV, official source various other sports. Live NetTV Live NetTV - Download here on Nokia, iPhone, Blackberry supplies over TV networks worldwide, free streaming Live Net TV of videos as well as highlights.Live NetTV App Streaming is a part of how we consume.